“We love the visual nature of Stickyworld, and the idea of people being able to talk to each other online. They can see each other’s perspective, and we learn a lot from their conversation." Anne Wynde shares some insights about the current priorities of the Engagement and Consultation team, and how using online engagement tools provide more opportunities for staff and customers to have their say on the issues that matter to them, and for transparent decisions about service delivery. Claire: Why don’t we start talking about you? Tell me a bit about what you do? Anne: I have worked at the council for 6 years and my current role is Engagement and Consultation Development Officer in the Engagement and Consultation team. There are 12 of us in the team. We provide a central service supporting Strategic and Corporate Services as well as the three directorates: Adult Social Care and Health; Children, Young People and Education; and Growth, Environment and Transport. Our remit covers four activities. Providing advice, guidance and support for the council’s public consultations. Managing engagement with the council’s 7,600 staff. Overseeing internal staff communication channels. And managing the corporate customer feedback system and reporting. It’s a varied and interesting role. I get involved with lots of different activities. As a Development officer, I work with the Growth, Environment and Transport (GET) directorate, providing the link between them and the Delivery side of our team, supporting them to have high quality conversations with our customers through public consultations and with their staff through well planned and managed communication and engagement. Anne: First of all, I think it’s important to engage the public in the right way. Some people are distrustful of Local Authorities and Councils. We have to work hard to earn people’s trust. This means being transparent about the council’s plans, and being responsive when people share their views and feedback. We also need to ensure we don’t take a ‘one size fits all’ approach. County councils are facing tough times. Budget cuts have been going on for some time now, and finding smart ways to make savings is becoming more difficult. Councils have to make hard choices. It’s important that everyone - not just a select few - understand the challenges we face and, where it’s appropriate, can give us ideas to find solutions. Making sure our consultations are accessible and inclusive is essential. 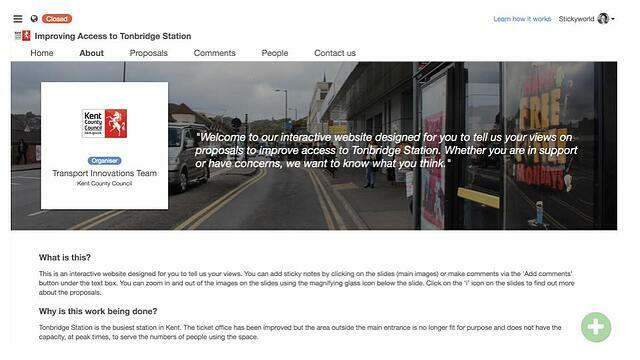 At Kent, we’re very clear that a successful consultation isn’t always about the number of responses we receive. A successful outcome can be having a smaller number of high quality conversations, and meaningful feedback which develops our thinking and helps our decision makers to make informed decisions. To achieve this, our team has to provide a very high standard of advice and delivery skills to the internal directorates. We have to ensure that the council isn’t open to any risks and all consultations follow best practice. And we apply the same level of dedication and expertise to our staff and customer engagement, making sure we listen, respond and act on feedback. There are a few behaviours that I think are key to achieving these priorities. Building good relationships and making good connections both inside and outside the council is key so that you build trust and have access to the information you need. And I think it’s important to try new things, not just repeating something that has worked for you in the past. Claire: What was the problem you were trying to solve when you started looking for a tool like Stickyworld? What was the context? Anne: We are always looking for new ways to engage and involve people and this includes looking at what other councils are doing. 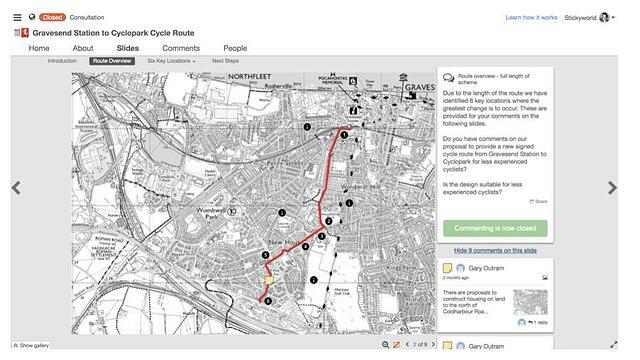 We came across Canterbury City Council using Stickyworld in spring 2016. We were open to exploring a new approach that was interactive and exciting - something that would pique people’s interest and curiosity and encourage them to get involved in our consultations. We love the visual nature of Stickyworld, and the idea of people being able to talk to each other online. They can see each other’s perspective, and we learn a lot from their conversation. Face-to-face engagement will always be important, but it’s resource heavy and not always convenient for those who want to engage with us. Whereas Stickyworld is available at a time that suits them. 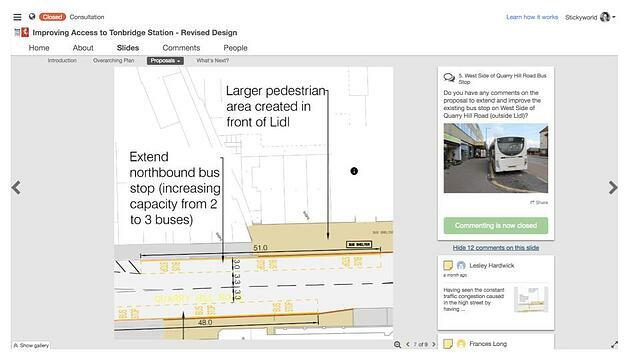 We wanted to provide more opportunities for people to engage with us in a cost effective way. Claire: How have you used Stickyworld? What has been most useful? 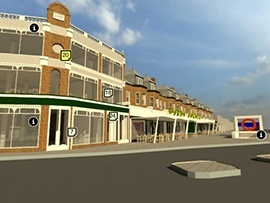 Anne: The first project we used Stickyworld for was to crowdsource feedback about the future of Sandwich Town. In effect, this was a virtual walkabout of Sandwich open to the whole community to take part. It was creative and different. We were really happy with the number of ideas we received from the public (475 comments) and it stimulated a lot of discussion and debate to inform the design process. These online consultations have been run in conjunction with consultation events and more traditional questionnaires, and they have been accessible 24 hours a day for specific period of time. It’s really easy for people to go online when they have a moment. They can explore the council’s plans which we explain using maps and images, zoom in and out leaving their comment on an exact location. There’s no need for them to juggle between viewing a long PDF document and completing a questionnaire. With Stickyworld it’s all in one place, and people seem to like this. Claire: Have you used it internally? Anne: Yes, we’ve also used our Stickyworld portal for staff engagement activities. It’s quick to set up online activities and then invite specific groups of colleagues to participate. We’ve run online forums with small groups of staff, and with whole directorates of 1,000 plus staff. Recently we ran a successful private online staff forum about the future of Libraries, Registration and Archives (LRA) asking staff for feedback to inform the creation of an ambition for the service. This was in addition to face-to-face workshops and opened up the opportunity to get involved to all staff within the division. This was particularly important for LRA staff as they are spread across the whole county and therefore it’s not always convenient for them to travel to physical events. We introduced the online forum with a video message from the head of the division, and were able to explain the context in a visual, interesting way. Colleagues could give their views, reply to each other’s comments, and like comments. It worked really well, with lots of great discussion. One of my jobs is to edit the GET staff newsletter. I set up an online workshop to ask for ideas about improving it. I received lots of great feedback. I don’t think if I used a questionnaire I would have had the same level of engagement. I did also run face-to-face focus groups and interviews, but I couldn’t repeat this on every site where my colleagues work. This way I could invite everyone from across lots of different council sites to take part - being inclusive and saving money at the same time. Claire: What is your advice for similar professionals or teams working like you to improve the way they engage people inside and outside of the organisation? Anne: Have a look around and see how other Local Authorities and Councils are tackling these challenges. I think it’s important to learn from others and be open to new engagement approaches. Online engagement doesn’t replace face-to-face. There will always be a need for this. But it can be part of your toolkit so you can operate a successful mixed methodology. Some authorities can be scared about having open conversations and public dialogue. We’ve found people respect transparency and generally don’t abuse it. We’ve never needed Stickyworld’s moderation tools, but we know they are there if we do. Claire: Any advice for other county councils in how they should approach the introduction of online engagement to their processes? Anne: Start small. Learn from this before you progress to bigger things. 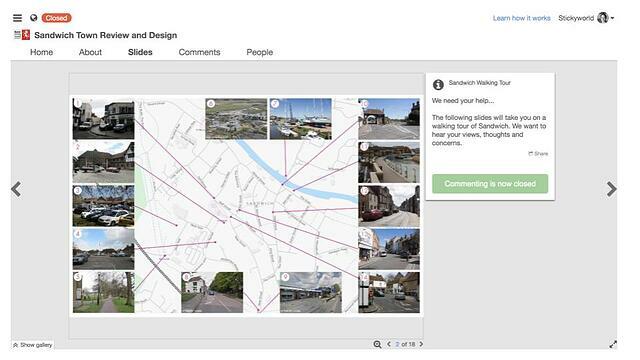 We started using Stickyworld with the crowdsourcing in Sandwich, a small town. Now we run larger and more contentious online consultations gathering people’s feedback from across Kent. 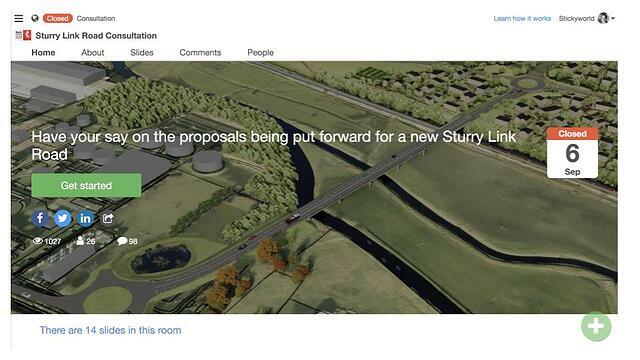 You can explore Kent County Council's Stickyworld public portal here. If you are interested in learning more about how Stickyworld helps County Councils and Local Government, get in touch to arrange a demo.